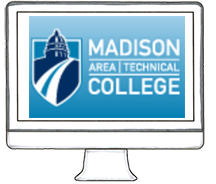 From myMadisonCollege- select the Find Username link. Your Student ID number is also printed on your OneCard (Student ID card), or can be found after logging into myMadisonCollege. How do I setup my Student Account? Length - your Password must be at least 10 characters long. Maximum length 25 characters. Do not use your Username, or your first, last, or middle name as part of the password. Do not use a Special Character as the first character in the Password when creating a student account. Follow any on screen prompts to help create a secure password. Do not reuse any of your last 4 passwords. Change your password at least once per year. Don't get locked out - After changing your password, remember to update your personal computer and mobile accounts right away on your personal computers or mobile devices for any college accounts (Blackboard, email, MC-Secure wireless,...) Your account may become locked if a device tries to connect unsuccessfully too many times. Password length and complexity, and changing passwords periodically, helps ensure the security of your network account, and college network security. 2: After that is complete, contact the Technology Services Help Desk 608-246-6666 B2277 if you would like your username and student email address updated. If you are a student and also an employee, you will have both a Student Account and an Employee Account. You will have two accounts with two usernames, passwords, and email addresses.The policies, allocations and permissions vary. How to forward email to another account? use forwarding or inbox rule? Your username and password for your program or certificate admissions application is probably different than your Madison College Student Account username and password. They are separate processes. For help with logging into ApplyWeb, contact the CollegeNET help desk.